Room on the Broom Live returns to the West End! Tall Stories return to the West End with their Olivier Award-nominated production Room on the Broom Live, adapted from Julia Donaldson and Axel Scheffler's beloved children's book. Playing a strictly limited festive season at the Lyric Theatre, the production is directed by Olivia Jacobs and features an ensemble of Tall Stories' best performers. Packed full of puppetry, laughter, fun and interactive songs and moments, this colourful stage show is the perfect treat for tiny theatregoers. Join the Witch and her cat, as they travel through the skies on their magical broomstick! As they pick up a friendly dog, a beautiful green bird and a crazy little frog - can the broom hold them all? SNAP - it breaks just as the hungry dragon appears! 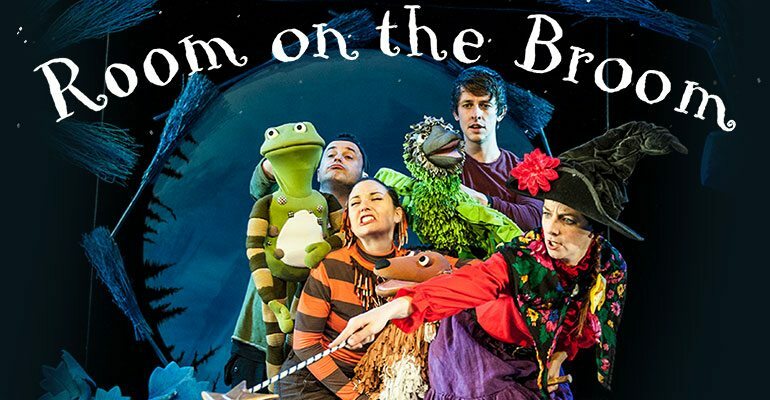 A charming tale that is full of scary fun and laughter, Room on the Broom Live is brought to life at London's Lyric Theatre.